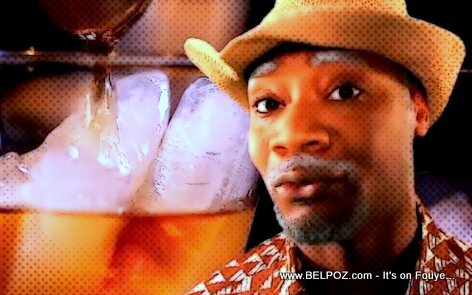 Haitian actor Daniel Fils-Aime aka Tonton Bicha is in the hot seat because of his latest commercial for Bakara, a rum imported from the Dominican Republic into Haiti...The latest commercial is calling Bakara a "Rhum Culturel", that has upset a lot of people. Le nouvelliste release an article today with a long list of people who are imply upset because the latest commercial for Bakara trashes "Pa Ban m kou" (Barbancourt) and the vodou religion is use in the commercial in a way that upsets the Ati Max Beauvoir, the supreme vodou leader in Haiti. "This advertisement is demeaning for voodoo and Barbancourt , a national product ," Max Beauvoir says. " Voodoo has been treated trivial . It would not be done to another religion , "says the supreme leader of voodoo in Haiti . "We must stop the broadcasting of this advertising as soon as possible," recommends Max Beauvoir . "RHUM BAKARA A RECONNU MA JUSTE VALEUR. POUR D'AUTRE, J'ETAIS TROP CHER. JE SUIS DESOLE. IT'S TOO LATE NOW." Should a businessman opt not to get paid his money's worth in order to protect a money making venture solely because of National pride? mwen ta renmen konnen eske Barbancourt ka ale fe yon bagay consa sen domeng? Peye big papi Ortiz ou bien Alex Rodriguez pou al desan produit ak imaj lakay li konsa. Wi, individuellement, nou gen chwa fe tout sa ou mentione la yo, collectivement gen bagay depi nou accepte yo, pays a fin tounen yon latrinn nan men nou. Mwen tande anpil pale anpil kap fèt sou publicité tonton Bicha fè pou rhum BAKARA ki ta vle fè kwè ke Bicha pa patriote et li ta derespekte religion Vaudou, mwen penser ke se très méchant pou nou vle detrui yon gro comedien nan trempe Tonton BIcha konsa, moun sa yo map di nou Maladie nou soufri a se li menm pou nou di Docteur a, pou nou konprann kilès moun sa yo ye fok nou al tande yon musique groupe NU LOOK fè ki rele COMPETITION: depi'n gen konesans lakay pa janm wè'l fè sans pou consommateurs genyen choix, se yon ki group de moun ki toujou vle genyen monopole » nou renmen HAITI konsa men lè'm voyager avec nou mwen wè kote nou ale tcheke nan immigration an li ekri: US RESIDENTS and US CITIZENS, nou pa janm tcheke nan US VISITORS, madanm nou toujou ale accoucher à l'Etranger, menm taxes nou pap peye pou HAITI mache, nou di nou pa renmen Dominicain men lè nou ale club SAXO Petion Ville se pou fanm Dominicaine nou mande, alors nou pa manje pistache men nou manje Manba? I hope Haitians aren't upset with me because I mentioned the work in Haiti with Prestige. It is indeed very sad that our Haitian culture has one of the worst habits, it is to develop everything and twist the story that in negativity towards a person forgetting, it is a person and their thoughts are probably very wrong! I am an Actor having several degrees in Theater along with years of experience in the field, in different Countries. You must choose the work you accept to do! It is a must! I am not a very big celebrity in the USA however you must know I have refused many jobs because they weren't worthy to me. I do not need it! As far as it goes, Clairin should be named the Rhum Culturel d'Haiti. This rum has been in the voodoo rituals for centuries. If the ougans have now become rich and have develop a taste for Barbancout, so be it. Business is business, Tonton Bicha did not do anything wrong; it's not like the product he advertised is illegal or anything. In the other hand, Haiti should increase their import taxes, while offering special incentive for those who have branches in the country and giving job to our people. Haitians are way to poor to have the little they have shipped to other country and make them richer. Is there a free trade agreement between Santo Domingo and Haiti? If there isn't, why the rum Bakara is allowed to enter Haiti? However, if the product is legitimate in Haiti; therefore, the artist should not be sensored.